Top Notch Material: Lassig Signature Glam- A Large Purse or Small Diaper Bag! Lassig Signature Glam- A Large Purse or Small Diaper Bag! 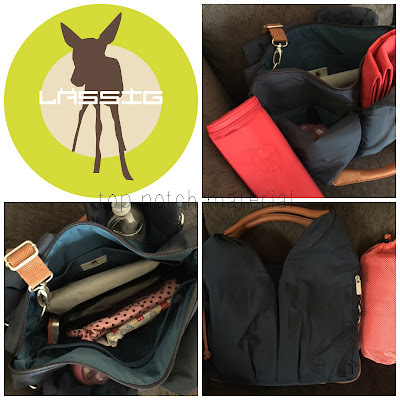 I reviewed the Lassig diaper bag last year, and I have seriously loved this thing! It was the bag I took to the hospital to have the princess because of its large size and multiple pockets! I was asked to review the Lassig Glam Signature bag this year and of course, I had to say yes. This bag is like the smaller version of the one I already have. In fact, I know this will almost certainly be my go to bag for when my daughter is a toddler. You know that awkward stage right? Where your kid doesn't need as much so you cannot justify a diaper bag anymore, but you still need something a tiny bit larger than a purse for snacks, sippy and change of clothes? This roomy bag is much like its larger counterpart with roomy interior, and tons of pockets. Inside each handle is pockets are that perfect for bottles, and the other pockets are great for all of the little extras you need. It even comes with an accessory kit (which you can order in contrasting colors for a cool look) that includes diaper changing pad, stroller hooks and bottle holder. 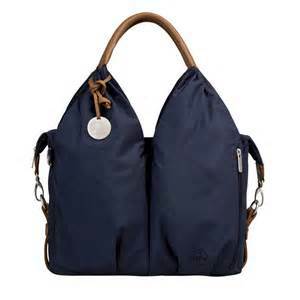 This functional, but still stylish bag comes in four beautiful colors: Sandstone, Navy (my selection), Black and Red. It measures approximately a foot and a half across and even offers a hook and cell phone compartment. The shoulder strap is also adjustable. Nothing has been overlooked in this amazing bag! As a busy mom, you know how important it is for functionality, but sometimes we want to look cute too, right? The Lassig Glam Signature offers both of those! I am so in love with this bag and I know you will love it too! That is really interesting looking. I like it. This looks like a nice diaper bag. Currently I'm using a small backpack as a diaper bag, thinking abotu getting a diaper bag purse soon though!